DisplayMate, a company specializing in scientific display testing and calibration, gave the Retina iPad Mini third place in detailed lab tests of three leading 7-inch tablets, criticising Apple for “really bad planning” for what it considers to be out-dated display technology. DisplayMate says that there are two problems with Apple’s use of IGZO (Indium Gallium Zinc Oxide) displays in its iPads. First, although IGZO was the best available technology two years ago, things have moved on, and the LTPS displays used by both the latest Kindle Fire and Nexus 7 tablets are now significantly better. Second, says the site, IGZO has suffered poor yield rates, and as a result Apple has not been able to get enough of them to use the displays in all of its iPads, mixing them with less-efficient Silicon a-Si screens. This has created a production problem where Apple is using both IGZO and a-Si displays in the current iPads. The problem is that a-Si has much lower power efficiency than IGZO, so it uses much more power and also needs bigger batteries. So how can Apple use both display technologies in the same product? I’ve been told by using much higher performance (and cost) White LEDs in the Backlight of the a-Si panels, which equalizes the power efficiency for both types of displays in different ways. As a result, both types of displays can be engineered into the same Tablet and can provide comparable results for the consumer. Shades of Samsung vs LG displays in Retina MacBook Pros here. While Apple is apparently succeeding in delivering the same brightness and battery-life with each, it does raise questions about the relative longevity of the two approaches. The very best of today’s display technologies? The Quantum Dots displays used in the Kindle Fire HDX 7 according to the report. Quantum Dots are almost magical because they use Quantum Physics to produce highly saturated primary colors for LCDs that are similar to those produced by OLED displays. They not only significantly increase the size of the Color Gamut by 40-50 percent but also improve the power efficiency by an additional 15-20 percent. Instead of using White LEDs (which have yellow phosphors) that produce a broad light spectrum that makes it hard to efficiently produce saturated colors, Quantum Dots directly convert the light from Blue LEDs into highly saturated primary colors for LCDs. You can see the remarkable difference in their light spectra in Figure 4. Quantum Dots are going to revolutionize LCDs for the next 5+ years. DisplayMate did give top marks to the iPad Mini display in many categories, praising its resolution, small color shift with different viewing angles, “close to perfect” contrast accuracy, accurate calibration, low reflectivity – and rating as “very good” its maximum brightness, black levels, contrast ratios and viewability in high ambient light. 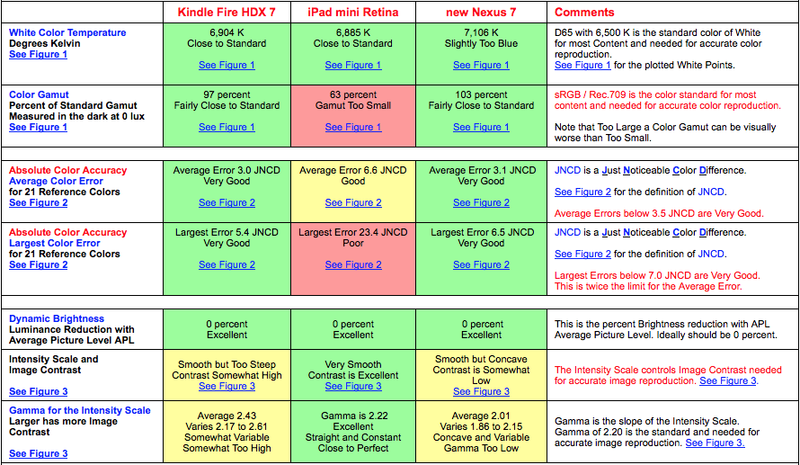 The greatest criticism was reserved for the 63% color gamut (range of colors that can be displayed) against 97 percent for the Kindle and 103 percent for the Nexus – an issue picked up in some earlier technical reviews. You can read chapter and verse, and see all of the detailed tables, over on the DisplayMate site. Of course, none of this changes the generally rave reviews the new Mini has received, but it will certainly be interesting to keep an eye on Quantum Dot displays to see if & when Apple makes the switch down the line.